If you are going to own property in Florida, whether residential or commercial, you need to understand what an easement is and how it may affect your rights as a property owner. An easement, in general, is a right to go onto someone else’s land without having any ownership interest in it. You will often hear of it as a nonpossessory interest in another person’s property. You may have an easement in relation to another person or business’s property or another person or business may have an easement to come onto or use your property. Not all easements are exactly the same. 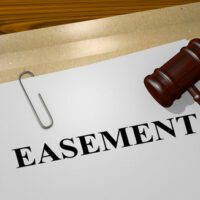 There are two broad categories of easements: easement appurtenant and easement in gross. An easement appurtenant benefits one parcel of land to the detriment of another parcel of land. The land that has the easement on it is called the servient estate while the land that benefits from the easement is known as the dominant estate. These easements are attached to the land itself and pass from one person’s ownership to another automatically. An easement in gross benefits a person or entity and not a parcel of land. When the land that is subject to the easement is sold, the easement generally transfers with the land. However, when the individual or entity who benefits from the easement changes, it may not pass the easement to a new person. Landowners and other individuals create easements in a number of ways. An express easement is a formal way of creating this right and requires a written agreement. The contract must be signed by both parties involved and are usually recorded on the property deeds. An implied grant of way of necessity arises when one parcel of land needs the other for access – meaning the owner cannot get to his or her land without crossing over the other parcel – and the two parcels were previously part of a larger whole. When this is the case, a right-of-way is presumed by Florida law. There is also a second, statutorily prescribed type of easement by necessity but it is for specific types of land, intended for specific purposes, and requires an easement for entry to that land. If you believe your land is affected by an easement or an easement you benefit from has been challenged, contact a Florida real estate attorney of the Law Offices of Larry E. Bray, P.A. at 561-571-8970.